Download "Memorandum of Understanding Between University of North Texas and INTI College, Malaysia"
3 Amendment to Articulation Agreement Between INTI College, Malaysia And University of North Texas The following amendment to the current articulation agreement dated September 17, 2002, is hereby approved: University of North Texas is accredited by the Commission on Colleges of the Southern Association of Colleges and Schools (SACS), a US American regional accrediting agency. 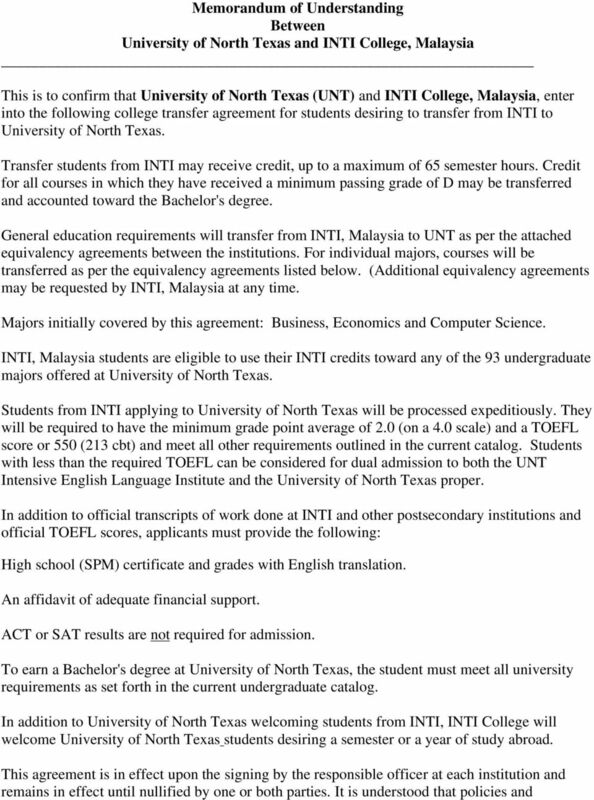 Although North Texas accepts credit in transfer from INTI College, Malaysia, as specified in this articulation agreement, the SACS accreditation does not extend to INTI College, Malaysia, itself. Likewise, INTI College, Malaysia is recognized by the Ministry of Education of Malaysia, but this recognition does not extend to University of North Texas itself. 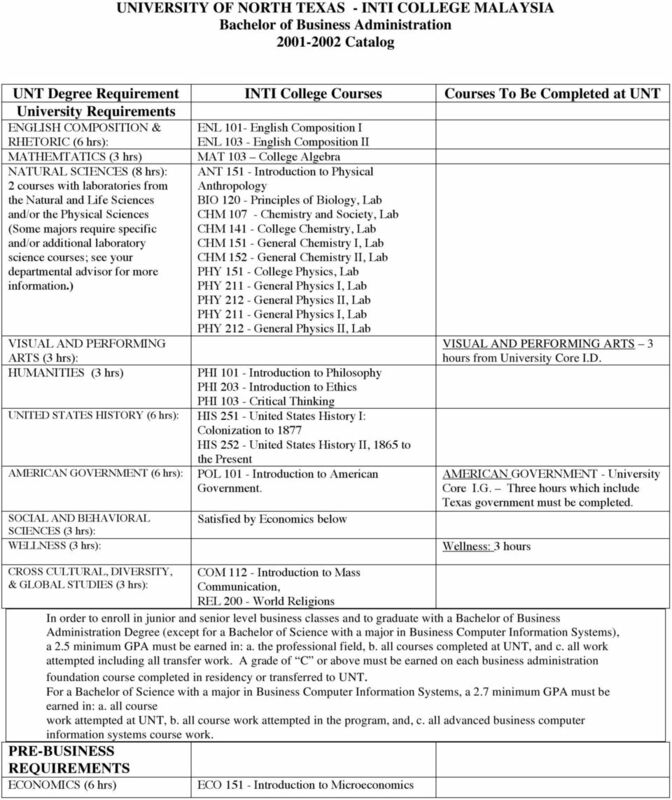 Although University of North Texas accepts INTI College, Malaysia, coursework as specified, other colleges and universities may not accept this work in transfer, even if it appears on the transcript of University of North Texas. Each institution decides for itself whether to accept transfer credit from another institution. Signed for and on behalf of University of North Texas Signed for and on behalf of INTI College, Malaysia. Dr. Jean Schaake Associate Dean, Arts and Sciences University of North Texas. Dr. William Borges Assistant Director Center for American University Program INTI College, Malaysia Date: Date:..
5 CHM 211 CHM 212 COM 112 Organic Chemistry I, Lab Organic Chemistry II, Lab Introduction to Mass Communication CHEM (1) no advanced credit CHEM (1) no advanced credit JOUR 1210 major or minor. Applies toward Chemistry or Biochemistry major or minor. Applies toward Chemistry or Biochemistry major or minor. Applies toward University Core Cross Cultural, Diversity & Global Studies. Also required for Journalism major or minor. 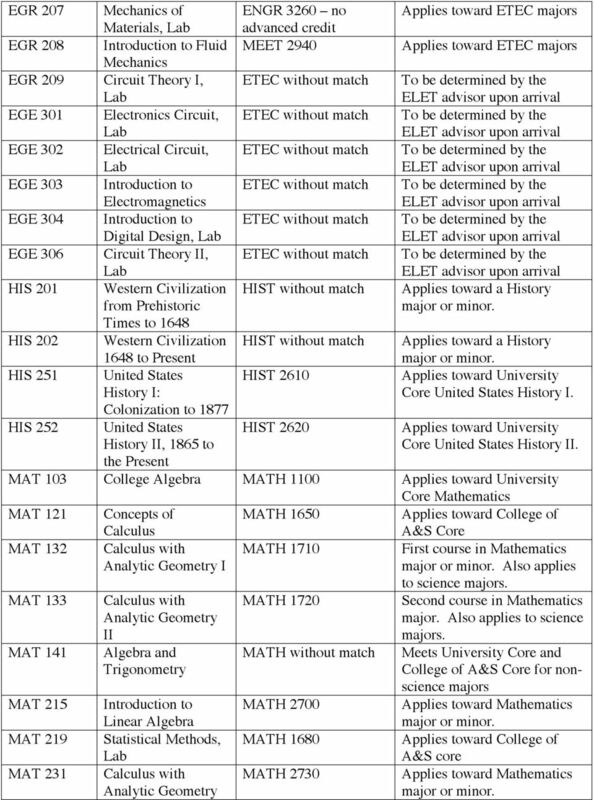 8 EGR 207 Mechanics of ENGR 3260 no Applies toward ETEC majors Materials, Lab advanced credit EGR 208 Introduction to Fluid MEET 2940 Applies toward ETEC majors Mechanics EGR 209 Circuit Theory I, Lab ETEC without match To be determined by the ELET advisor upon arrival EGE 301 Electronics Circuit, Lab ETEC without match To be determined by the ELET advisor upon arrival EGE 302 Electrical Circuit, Lab ETEC without match To be determined by the ELET advisor upon arrival EGE 303 Introduction to Electromagnetics ETEC without match To be determined by the ELET advisor upon arrival EGE 304 Introduction to Digital Design, Lab ETEC without match To be determined by the ELET advisor upon arrival EGE 306 Circuit Theory II, Lab ETEC without match To be determined by the ELET advisor upon arrival HIS 201 Western Civilization from Prehistoric HIST without match Applies toward a History major or minor. Times to 1648 HIS 202 Western Civilization 1648 to Present HIST without match Applies toward a History major or minor. HIS 251 United States History I: HIST 2610 Applies toward University Core United States History I. Colonization to 1877 HIS 252 United States History II, 1865 to HIST 2620 Applies toward University Core United States History II. 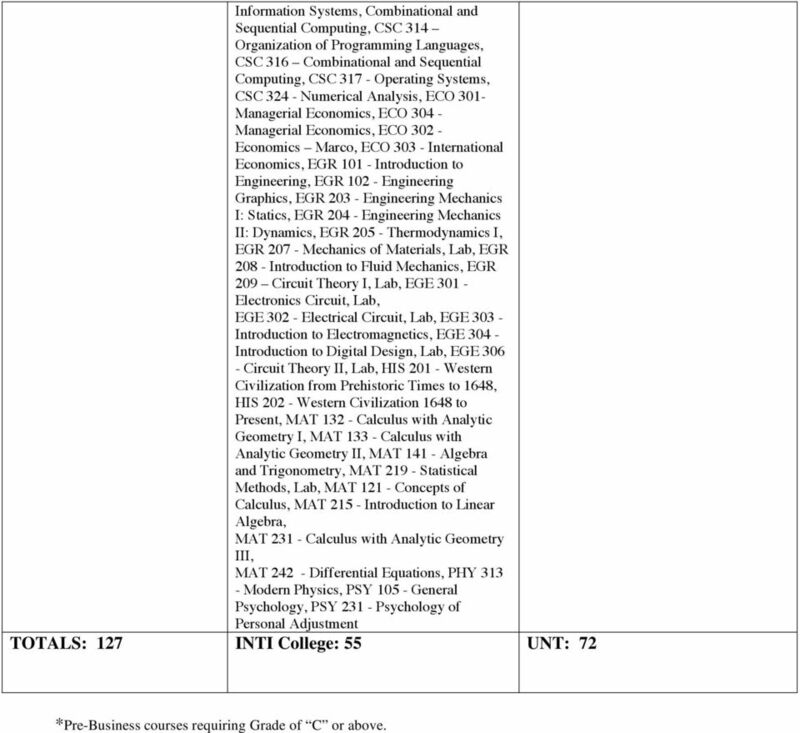 the Present MAT 103 College Algebra MATH 1100 Applies toward University Core Mathematics MAT 121 Concepts of Calculus MATH 1650 Applies toward College of A&S Core MAT 132 Calculus with Analytic Geometry I MATH 1710 First course in Mathematics major or minor. 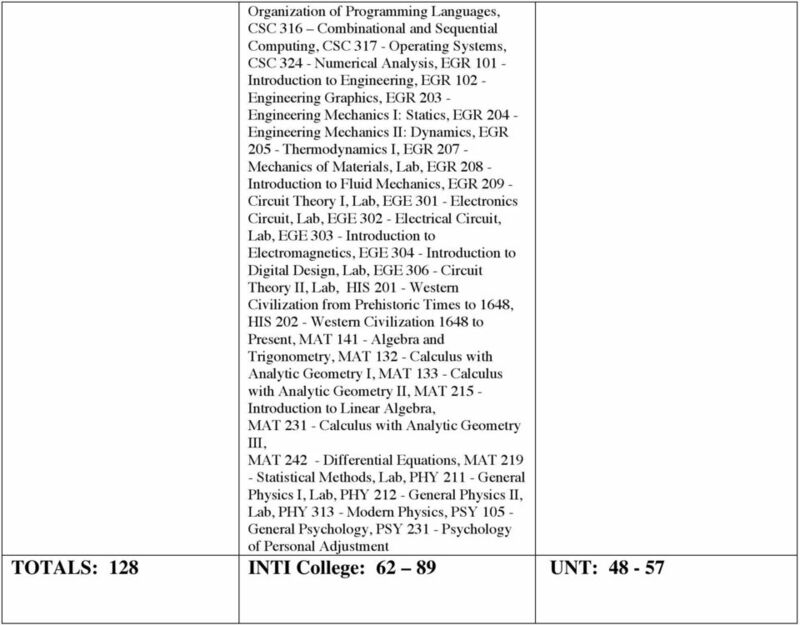 Also applies MAT 133 MAT 141 MAT 215 MAT 219 MAT 231 Calculus with Analytic Geometry II Algebra and Trigonometry Introduction to Linear Algebra Statistical Methods, Lab Calculus with Analytic Geometry MATH 1720 MATH without match MATH 2700 MATH 1680 MATH 2730 to science majors. 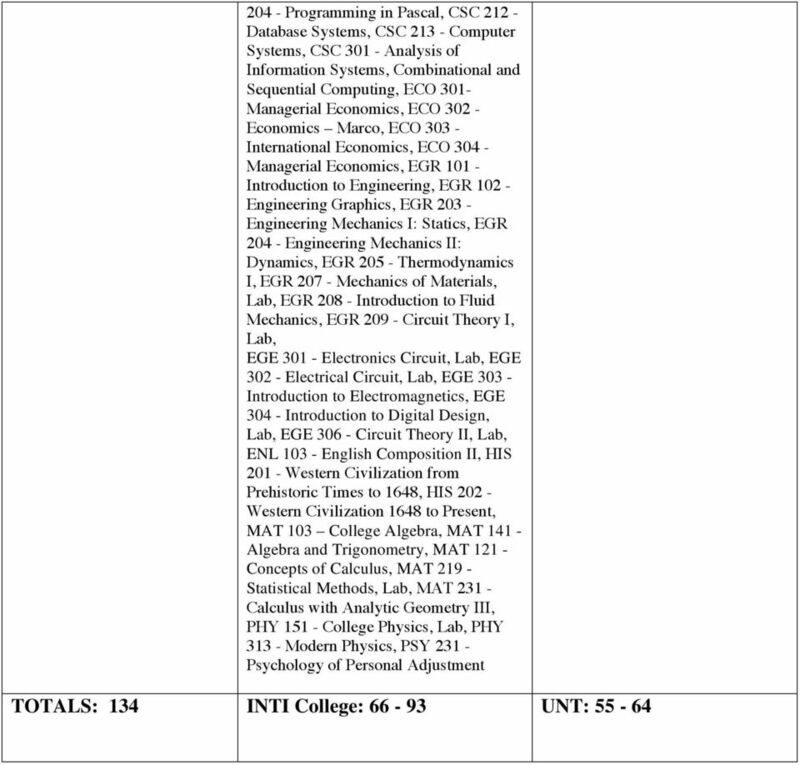 Second course in Mathematics major. Also applies to science majors. 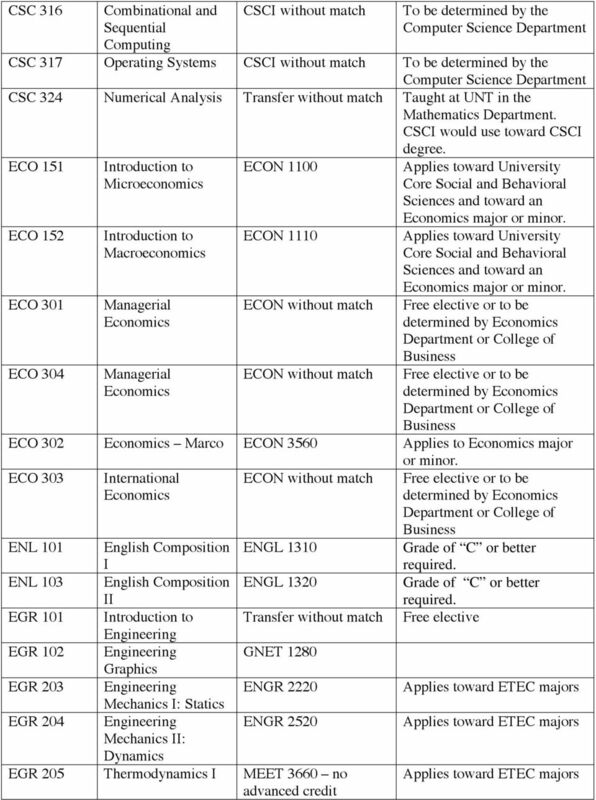 Meets University Core and College of A&S Core for nonscience majors Applies toward Mathematics major or minor. 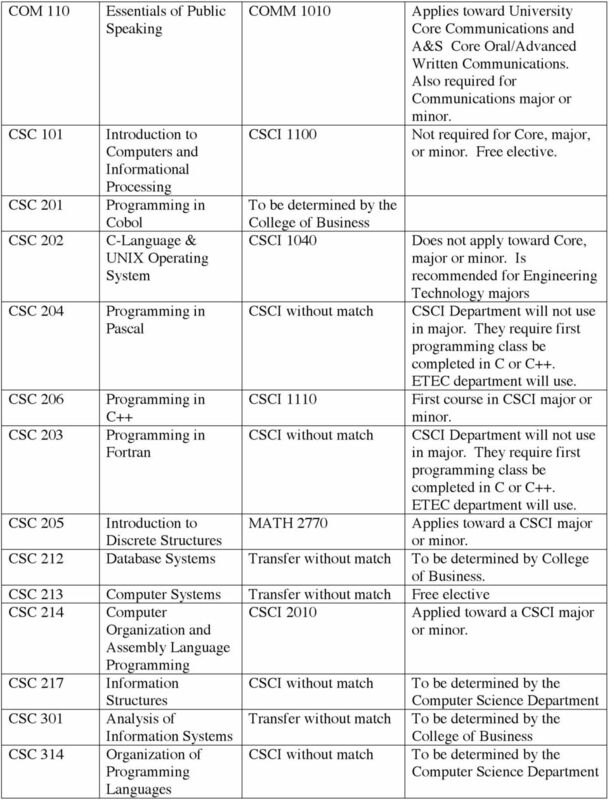 Applies toward College of A&S core Applies toward Mathematics major or minor. 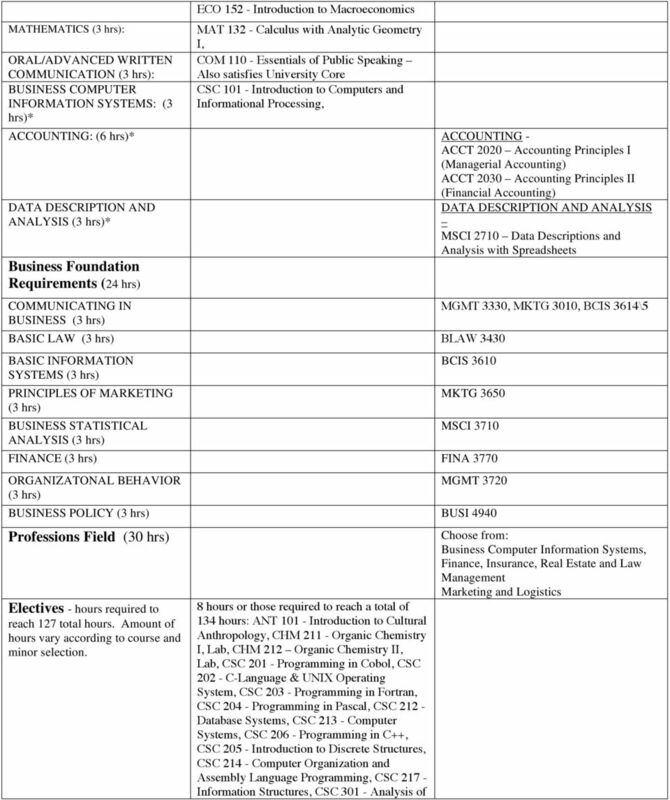 9 MAT 242 PHI 101 PHI 203 III Differential Equations Introduction to Philosophy Introduction to Ethics MATH 3410 no advanced credit PHIL 1050 PHIL 1050 Applies toward Mathematics major or minor. Applies toward University Core Humanities. Also first course in Philosophy major or minor. Applies toward University Core Humanities and a course in Philosophy major or minor. PHI 103 Critical Thinking PHIL without match Applies toward University Core Humanities and a course in Philosophy major or minor. PSY 105 General Psychology PSYC 1630 Applies toward University Core Social and Behavioral Sciences. Also applies toward a Psychology major or minor. PSY 231 Psychology of Personal Adjustment PSYC 2480 Applies toward a Psychology major or minor. 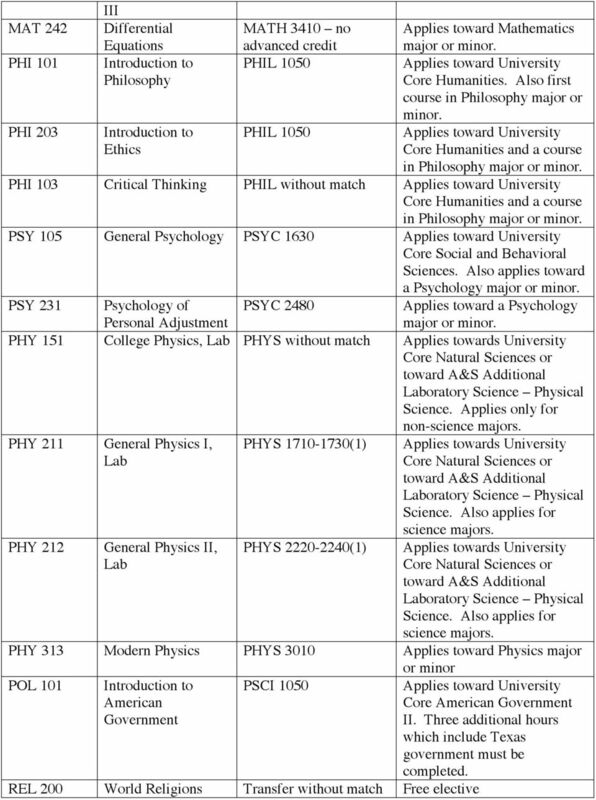 PHY 151 College Physics, Lab PHYS without match Applies towards University Core Natural Sciences or toward A&S Additional Laboratory Science Physical Science. Applies only for non-science majors. 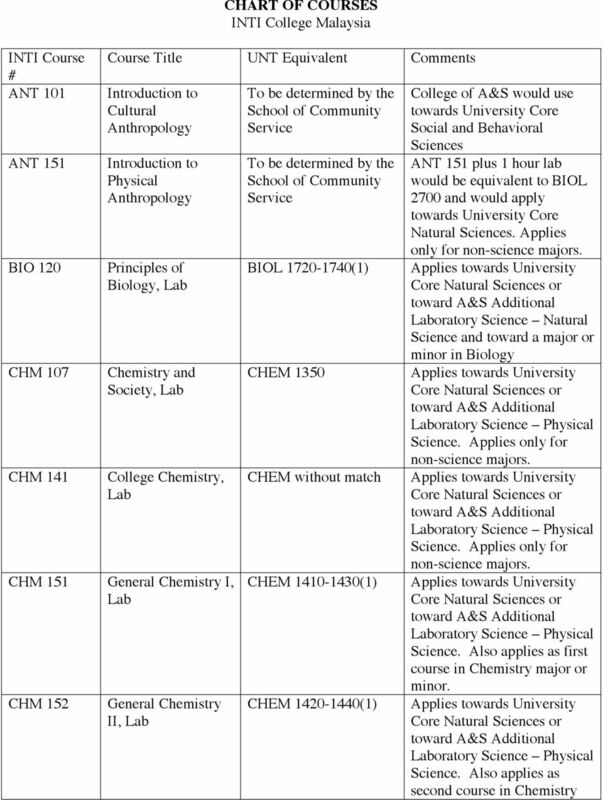 PHY 211 General Physics I, Lab PHYS (1) Applies towards University Core Natural Sciences or toward A&S Additional Laboratory Science Physical Science. Also applies for science majors. 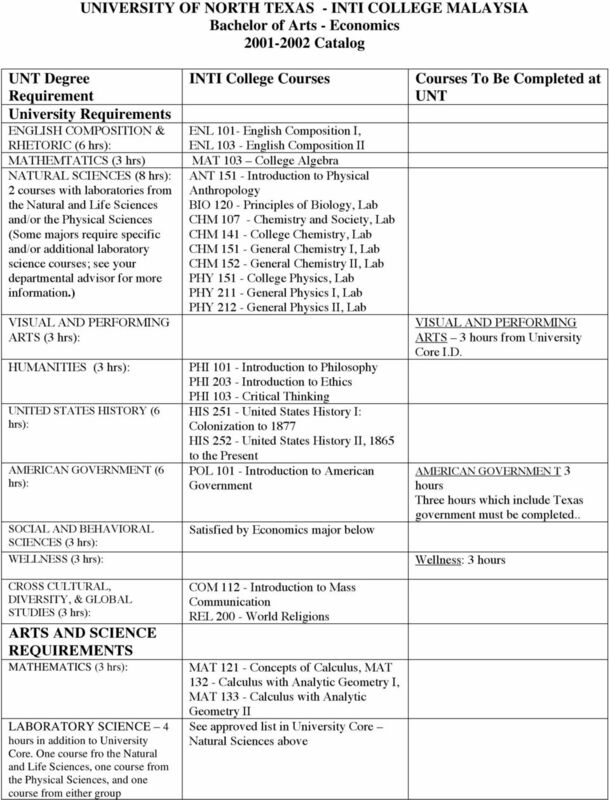 PHY 212 General Physics II, Lab PHYS (1) Applies towards University Core Natural Sciences or toward A&S Additional Laboratory Science Physical Science. Also applies for science majors. PHY 313 Modern Physics PHYS 3010 Applies toward Physics major POL 101 Introduction to American Government PSCI 1050 REL 200 World Religions Transfer without match Free elective or minor Applies toward University Core American Government II. Three additional hours which include Texas government must be completed. 13 Information Systems, Combinational and Sequential Computing, CSC 314 Organization of Programming Languages, CSC 316 Combinational and Sequential Computing, CSC Operating Systems, CSC Numerical Analysis, ECO 301- Managerial Economics, ECO Managerial Economics, ECO Economics Marco, ECO International Economics, EGR Introduction to Engineering, EGR Engineering Graphics, EGR Engineering Mechanics I: Statics, EGR Engineering Mechanics II: Dynamics, EGR Thermodynamics I, EGR Mechanics of Materials, Lab, EGR Introduction to Fluid Mechanics, EGR 209 Circuit Theory I, Lab, EGE Electronics Circuit, Lab, EGE Electrical Circuit, Lab, EGE Introduction to Electromagnetics, EGE Introduction to Digital Design, Lab, EGE Circuit Theory II, Lab, HIS Western Civilization from Prehistoric Times to 1648, HIS Western Civilization 1648 to Present, MAT Calculus with Analytic Geometry I, MAT Calculus with Analytic Geometry II, MAT Algebra and Trigonometry, MAT Statistical Methods, Lab, MAT Concepts of Calculus, MAT Introduction to Linear Algebra, MAT Calculus with Analytic Geometry III, MAT Differential Equations, PHY Modern Physics, PSY General Psychology, PSY Psychology of Personal Adjustment TOTALS: 127 INTI College: 55 UNT: 72 *Pre-Business courses requiring Grade of C or above. 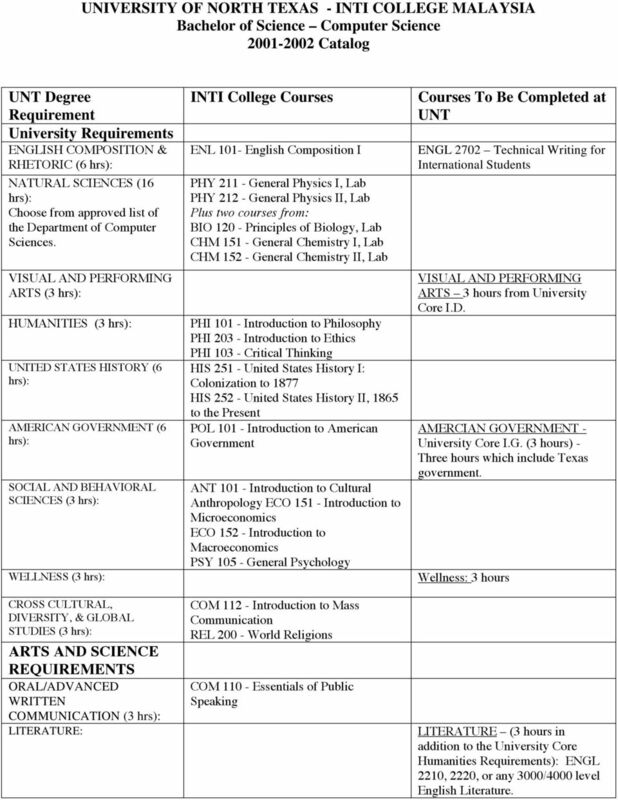 14 UNIVERSITY OF NORTH TEXAS - INTI COLLEGE MALAYSIA Bachelor of Science Computer Science Catalog UNT Degree Requirement University Requirements ENGLISH COMPOSITION & RHETORIC (6 hrs): NATURAL SCIENCES (16 hrs): Choose from approved list of the Department of Computer Sciences. VISUAL AND PERFORMING ARTS (3 hrs): HUMANITIES (3 hrs): UNITED STATES HISTORY (6 hrs): AMERICAN GOVERNMENT (6 hrs): SOCIAL AND BEHAVIORAL SCIENCES (3 hrs): WELLNESS (3 hrs): CROSS CULTURAL, DIVERSITY, & GLOBAL STUDIES (3 hrs): ARTS AND SCIENCE REQUIREMENTS ORAL/ADVANCED WRITTEN COMMUNICATION (3 hrs): LITERATURE: INTI College Courses ENL 101- English Composition I PHY General Physics I, Lab PHY General Physics II, Lab Plus two courses from: BIO Principles of Biology, Lab CHM General Chemistry I, Lab CHM General Chemistry II, Lab PHI Introduction to Philosophy PHI Introduction to Ethics PHI Critical Thinking HIS United States History I: Colonization to 1877 HIS United States History II, 1865 to the Present POL Introduction to American Government ANT Introduction to Cultural Anthropology ECO Introduction to Microeconomics ECO Introduction to Macroeconomics PSY General Psychology COM Introduction to Mass Communication REL World Religions COM Essentials of Public Speaking Courses To Be Completed at UNT ENGL 2702 Technical Writing for International Students VISUAL AND PERFORMING ARTS 3 hours from University Core I.D. AMERCIAN GOVERNMENT - University Core I.G. (3 hours) - Three hours which include Texas government. Wellness: 3 hours LITERATURE (3 hours in addition to the University Core Humanities Requirements): ENGL 2210, 2220, or any 3000/4000 level English Literature. 18 ORAL/ADVANCED WRITTEN COMMUNICATION (3 hrs): LITERATURE (3 hrs, in addition to the University Core Humanities Requirement): FOREIGN LANGUAGE (2 courses):. COM Essentials of Public Speaking Waived: native language or Chinese LITERATURE: (3 hours in addition to the University Core Humanities Requirements): Bachelor of Arts Economics major requirements STATISTICS (3 hrs) ECONOMICS MAJOR: (30 hours): ECON , 3550, 3560, 4020 plus 12 additional upperdivision hours above 3000 level. 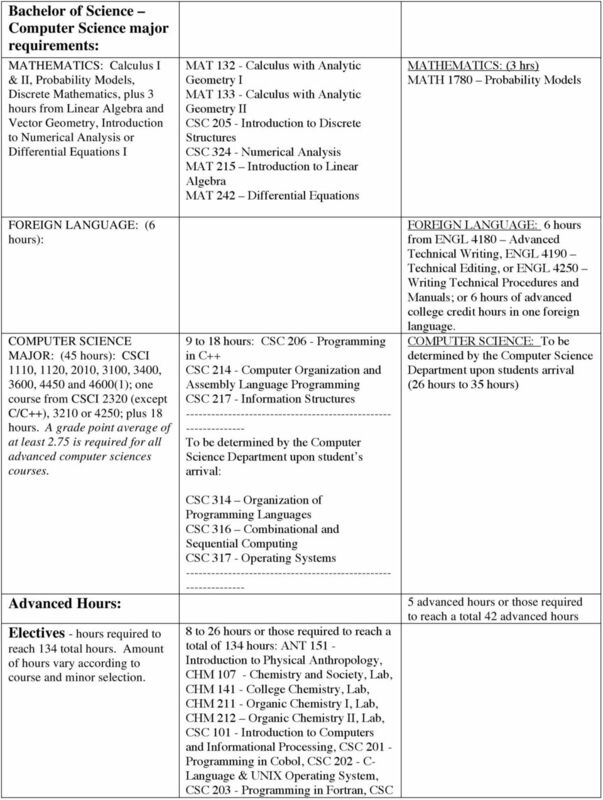 Advanced Hours: 42 advanced hours of junior and senior level work Electives - hours required to reach 128 total hours. 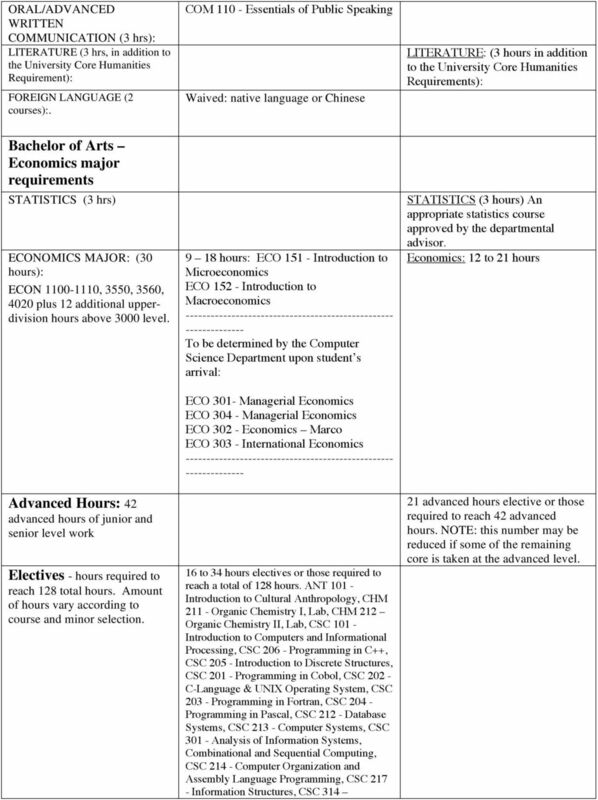 Amount of hours vary according to course and minor selection hours: ECO Introduction to Microeconomics ECO Introduction to Macroeconomics To be determined by the Computer Science Department upon student s arrival: ECO 301- Managerial Economics ECO Managerial Economics ECO Economics Marco ECO International Economics to 34 hours electives or those required to reach a total of 128 hours. ANT Introduction to Cultural Anthropology, CHM Organic Chemistry I, Lab, CHM 212 Organic Chemistry II, Lab, CSC Introduction to Computers and Informational Processing, CSC Programming in C++, CSC Introduction to Discrete Structures, CSC Programming in Cobol, CSC C-Language & UNIX Operating System, CSC Programming in Fortran, CSC Programming in Pascal, CSC Database Systems, CSC Computer Systems, CSC Analysis of Information Systems, Combinational and Sequential Computing, CSC Computer Organization and Assembly Language Programming, CSC Information Structures, CSC 314 STATISTICS (3 hours) An appropriate statistics course approved by the departmental advisor. Economics: 12 to 21 hours 21 advanced hours elective or those required to reach 42 advanced hours. NOTE: this number may be reduced if some of the remaining core is taken at the advanced level.